John felt more energy in the next few days, not enough to exit his unit. More days passed before he again felt strength enough to walk. The park clouds cast gray-shade overtop the grass, the dogs and runners. A mischievous patch of blue peeked through the graying vapor and glided slowly out of the park limits, moving a section of light across the ball players. Runners, fewer dogs, fewer young persons occupied the park this day, and that fact made sad old John, his spirits rising regardless. He walked nearer to the lake and another bench, this time cement, offered an uneven surface to the surrounding fatigue. A woman in loose-fit jeans and sweatshirt walked with a large dog, perhaps parts Dane and Shepherd. The dog was lively but slow-moving, holding an ancient propriety and kindness in his limbs. 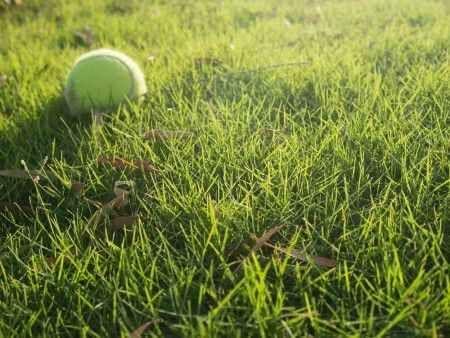 The woman threw a ball about one-hundred yards away and the dog toddled toward it, rocking up and then down onto the ground as he moved. He stopped short of the yellow prey, returned to the woman without it. She pointed and yelled something, then walked with some agitation to retrieve the toy. Ball in hand, the woman gradually approached John and his bench, her breath short. She leaned toward the seat when she arrived and more pulled herself onto the bench then sat, finding place near old John. The dog ambled up near the woman and put down its tired form at her feet; she slapped lightly his haunch. Her medium-brown hair let loose a strand that she pulled back into place, retying the thick mass behind her tanned head. The gesture gave her a disheveled appearance. She wore baggy clothes and John was unable to discern, uninterested in, her shape. She groaned as she sat, and stretched out one of her legs before her. She rolled her head around and then leaned back, closing her eyes. The dog lounged as dogs do. The woman opened her eyes and turned to John. “I like to think, I like to think,” her strained smile lost her train of thought. “Oh yeah. Tired. That’s right,” she laughed, nervous. “Oh, I have some health issues. And I…tire easily, you know?” Again came the nervous laugh. John straightened himself and directed his gaze more intensely at Marylyn. “I'm sorry to hear,” he said, genuinely interested. John shifted in his seat and tapped his thigh a few times. The dog arose from his position, clapped the ball with his jaws, lobbed it into Marylyn’s lap. She stood up and threw it and the dog trotted away, stopping before he arrived at ball. John found himself. John engaged a fierce silence. Marylyn got up – dog at heel – in order to retrieve the ball from its distant location, threw it back toward John. It landed fifteen feet away from the bench and the trotting dog approached but never picked up the toy in its olden, still-powerful jaws. Marylyn sat again next to John. “Where are you from?” she asked in a friendly tone. “Is your place nearby? Mine is right over there.” She pointed. John inhaled abruptly. Marylyn knitted her brows and tapped her big dog once again. John glanced back at the woman as she again threw the ball, the dog lounging on the grass. When John returned to his unit, he again sat at his dining room table and reread that passage about moving mountains. He was anxious to talk with Nick and Ruth about when they would meet. He scanned the many channels that awaited him and decided upon preacher Marvin and then yet another documentary on the fact of the resurrection. “How sad that such a kind and decent woman doesn’t have God,” he thought.